It's a pop culture universe. Bonfire helps brands achieve orbit. fandom for more than three decades. Here's where it's hottest right now. Did Comic-Con Culture Save Basic Cable? Unconventional Branding Opportunities …at Conventions! If you don’t know by now that geeks are doing the bullying these days, I’d urge you to mention the words “Game of Thrones” or “Doctor Who” around the office water cooler. “The Avengers” director Joss Whedon is one of the most powerful men in Hollywood, and Facebook founder Mark Zuckerberg practically owns your social life. The nerds have won. The revenge is over. So where do we celebrate? If you live in east Winter Park, you may already know the answer. While it’s impossible to pinpoint the moment when nerds became cool, it was a comic-book store called A Comic Shop that first started to locally embrace them as such. Strategically situated across the street from the media-savvy students of Full Sail University, the name is the only humble thing about the place, which has been hosting events such as nerdcore rap concerts and burlesque nights along with the usual comic-book signings since it opened in 2005. Sure enough, while there are plenty of flat-screen TVs around, you’re more likely to see “Rollerball” (James Caan’s 1975 sci-fi cult film) than football. Saturday-morning cartoons are a regular staple on screens that the regulars aren’t using for video games — just one perk of a membership card (though anyone can drop by the bar during A Comic Shop’s regular hours). Geek Easy membership runs $9.95 a month and allows users access to a full library of Xbox 360 and PS3 games, plus free entry to events such as the popular weekly screenings of “Game of Thrones” and “The Walking Dead.” Didn’t know “The Walking Dead” began its (un)life as a comic book? Membership also includes access to a well-stocked lending library of graphic novels — a great way to catch up. Sure enough, the Geek Easy will continue to host plenty of parties for the nerd faithful or curious newbies alike. 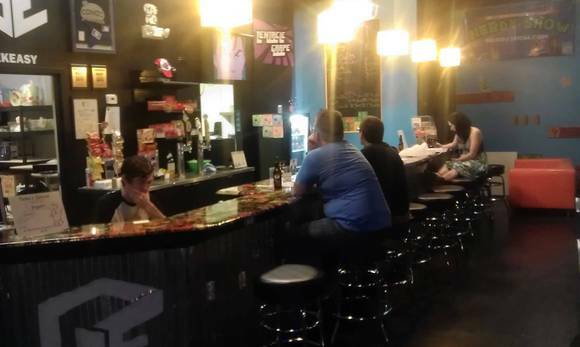 Special events include a new “Comics & Comics” comedy showcase at 9 p.m. Thursday (April 18), and a weekly geek trivia night on Tuesdays starting April 23 at 8 p.m. Both are free, and here’s hoping the Geek Easy keeps its doors open for plenty more. Live long and prosper, guys.